Sarah Nematallah and Min-Jeong Koh (violins), Caitlin Boyle (viola) and Rebecca Wenham (cello). In August 2009, I had the opportunity to catch a live performance of the Cecilia String Quartet on the Lake Ontario waterfront in Toronto. They performed the Quartet in C Major, Op. 74 No. 1, by the "father of the string quartet," Joseph Haydn, and the sparkling, newly discovered String Quartet No. 1 in E-flat Major by French composer Theodore Dubois (1837-1924). They are highly talented musicians and I thoroughly enjoyed the Haydn string quartet. The location of the performance at the Toronto Waterfront	is right across from the Toronto Island Airport which provided ample distraction with the noise of the planes. 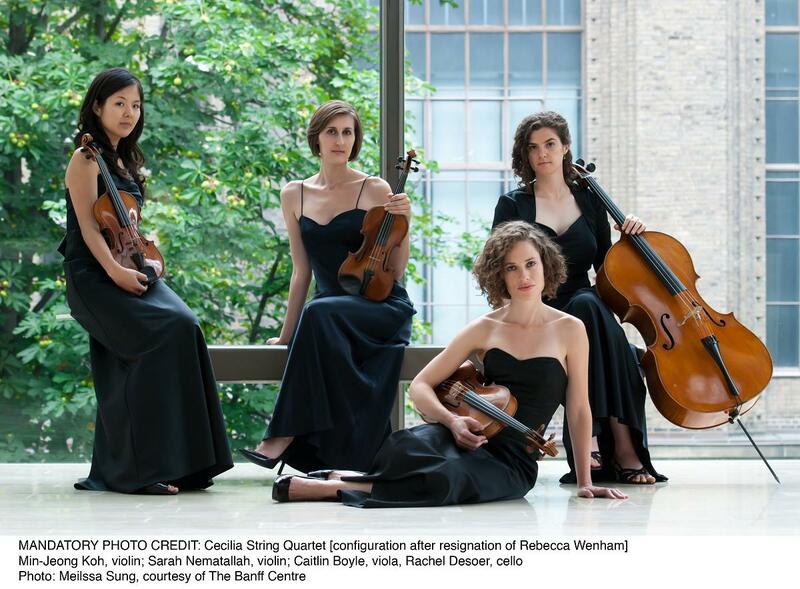 The Cecilia String Quartet joined with Cellist Shauna Rolston to perform Schubert's Quintet in C Major at the Toronto Music Garden.